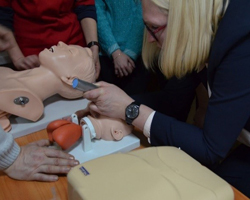 To improve the quality of health care services and reduce health risks for over 40 000 people in need in non-government controlled areas of Ukraine’s Luhansk region, WHO trained over 30 health workers on 23—25 January 2019. The training focused on supporting emergency health care specialists in trauma emergency care and lifesaving procedures. After nearly five years of crisis in eastern Ukraine, millions of people on both sides of the contact line still need humanitarian assistance. A lack of trained health care workers and appropriate health care services can result in an increase in avoidable deaths, diseases and disabilities. The training was organized with the financial support of the United Nations Central Emergency Response Fund (CERF). Additionally, CERF funds enabled WHO to deliver medicines and medical supplies in eastern Ukraine’s non-government controlled areas.